The Trump administration seems bent on unraveling the progress made under Obama. Since taking office, Donald Trump’s administration has tried to roll back the clocks on climate change, burying government research and data and blocking agencies from doing their work. But these moves are simply setting a foundation. The Trump team's most decisive moves are yet to come. “Even as [Trump] promised to harness the energies, industries and technologies of tomorrow, he was already acting to strangle the fast-growing clean energy economy and anchor our future to the dirty fuels of the past," said Rhea Suh, President of the Natural Resources Defense Council President, in a statement. Hours after Donald Trump was sworn in as the 45th president, the White House website was stripped of information on climate change. In its place, the issues page said that the Climate Action Plan — Obama’s core strategy for confronting climate change — will be dismantled and investments in coal will increase. Next, the Trump team told the Environmental Protection Agency to scrub its website of climate change information. Years of research on emissions, global warming, environmental changes, and so on may vanish as a result. "We're looking at scrubbing it up a bit, putting a little freshener on it, and getting it back up to the public,” spokesman Doug Ericksen told The Hill. "We're taking a look at everything on there." Then the new administration barred the EPA and other science-based agencies from using social media or engaging with the press. The latest target of this climate purge has been the State Department, which oversees the US’s diplomatic approach to climate change. US involvement in the historic Paris climate agreement, for instance, was handled through the State Department. While new administrations typically establish their tone and perspective on federal websites after taking office, the Trump team’s focus on eliminating climate change likely forecasts a long-term strategy of undermining climate science. It’s not like information on climate change will be impossible for the public to find. EPA employees are scrambling to safeguard all the material that will be deleted, the State Department website is archived, and activists are working to make all climate change research publicly accessible. The real threat is not this effort to suppress existing information — the objective reality of climate change can’t be disputed. The real threat is the huge budget cuts that will follow and the restructuring of organizations that will prevent the country’s scientists from gathering new data on the climate and finding solutions. A report last week included a leaked memo which called for slashing the EPA budget by $800M. 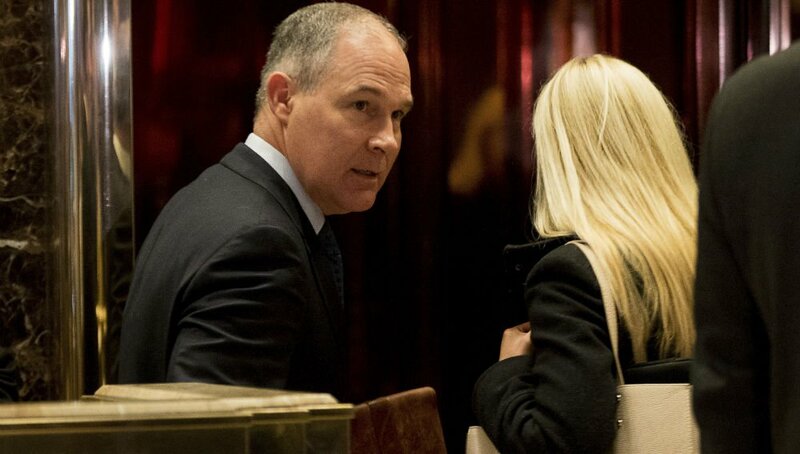 Already, the Trump administration has put a freeze on new grants and contracts from the EPA, “a move affecting research, industrial site redevelopment, air quality monitoring and education,” according to Newsweek. After discovering that such a freeze has immediate impacts, it was loosened to some extent. Beyond this clampdown, a memo outlining the administration’s plans for the EPA budget has been circulating and it shows dramatic cuts in areas such as state assistance, climate change programs, and broader environmental management. Numerous regulations will also be targeted such as the Clean Air Act, which has reduced air pollutants in the US by 60% since it was enacted in 1970 by President Richard Nixon, and the Clean Water Act, which, among other things, prevents factories from dumping toxic waste into water sources. Executive orders enacted under Obama are also vulnerable. For example, the Council of Environmental Quality issued a guidance calling on developers to conduct environmental sustainability surveys before construction to prevent buildings from being built in areas vulnerable to coastal erosion. There may even be a case-by-case review of EPA projects by the Trump administration in the future. Overall, it seems clear that the Trump administration is bent on unraveling the environmental progress made by the former administration.